Hi friend! I hope you’ve been having a wonderful week. 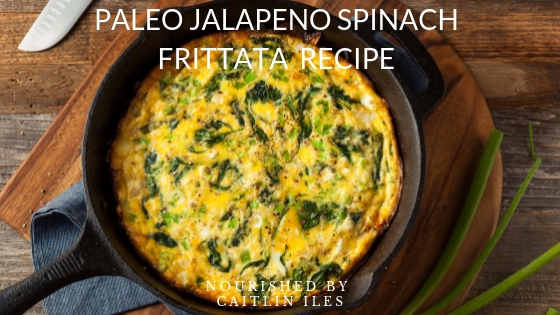 Today I’m going to share a super simple breakfast I’ve basically been living off of all week: Jalapeño Spinach Frittata Recipe. This recipe is ridiculously easy and you can make it in advance either in a large 10 x 10 baking dish or individual muffin tins to have a grab-and-go brekky jam packed full of protein, healthy fats & carbs, antioxidants, and all the nourishing goodness you need to start your day off with a bang! It’s so important that you make time to nourish your body with the proper foods so that you can go through your day without peaks and crashes in our energy or mood, so that you can maintain a healthy and stable blood sugar balance, and so that you feel your absolute best no matter how busy you are! I know that over the past couple of months I’ve been much busier than usual and so I’ve been relying on my sweet tips for meal prep magic and batch cooking to make sure I always have something healthy, filling, and, above all, delicious. How I usually do it is that I pick one day a week where I have a few hours free and I do all my grocery shopping. Then I’ll usually make a big pot of chili or curry, cut up my veggies for smoothies, juicing, or sides, whip up a sauce or vinaigrette, roast some chicken or sausages, make this frittata or my Easy Peasy Egg Cups To Go and finally make myself some healthy treats like my Chocolate Brain Boosters, Tahini Walnut Magic Bars, or a batch of Banana muffins. Prepping all these goodies (remember I’m only doing one of each typically!) in advance makes it so ridiculously easy to eat healthy and indulge mindfully that I don’t waste a single moment during the week thinking about what I have to eat, unless I want to. So let’s get to the good stuff now, shall we? And if you’re looking for even more inspiration with healthy recipes then make sure you download my FREE Anti-Inflammatory Meal Plan & Shopping List right here!